This bibliography is an attempt at keeping a quick record of my recent reads (both fiction and non-fiction) regarding the Union of Soviet Socialist Republics (USSR) and its history. The eagle-eyed among you will notice all of the volumes are English translations, and as such this imposes a boundary between what has and has not been translated. As always when one reads for pleasure and information personal choices are made, authors and tastes are developed and pursued, and books that should be read remain unread. Choices are partly dictated by access. For instance, I discovered Aleksandr Solzhenitsyn’s Cancer Ward and Mikhail Sholokhov’s And Quiet Flows the Don on my dad’s bookshelf, others such as the modern author Svetlana Alexievich by reading literary reviews and becoming aware of her work. Sometimes there is surprise that so monumental an author can remain forgotten within the sphere of common knowledge, such as Vasily Grossman, of whom I personally did not discover for far too long a time. Some volumes, such as Varlam Shalamov’s Kolyma Tales which is based on his experiences in the Gulag, are soon to be republished and I keenly await the volume. There are plenty of other volumes that have not been translated into a language I can read or simply authors that I remain ignorant of. Conference room of the Supreme Council in Tashkent, Uzbekistan, by noted photojournalist Max Penson (1893-1959). Following his forced movement to Uzbekistan with his family in 1914, Penson became one of the best-known photojournalists in the Soviet Union from 1920-40, particularly for his images of life in Uzbekistan. In later life he was forced to leave his employment in 1948 due to a rise in anti-Semitism. Photograph: M. Penson. Having wrote out a quick list of Soviet-era novels I’ve had the pleasure (and often sadness) to read, I find it thoroughly hard to pick one that is my favourite as the styles are so varied and the approaches so different. However and on reflection, there are three novels that stand out for me. They are the Don Epic (includes And Quiet Flows the Don and The Don Flows Back to the Sea, 1928-40) by Mikhail Sholokhov, The Master and Margarita (1967) by Mikhail Bulgakov, and Vasily Grossman’s Life and Fate (1960). All three offer varying degrees of criticism or support of the USSR and all three differ in their approach and in their individual authors fate. Some circulated as samizdat (underground literature), whereas others were State sanctioned and celebrated. Many authors who were active during the revolutions of 1917, such as Teffi and Yury Felsen, saw the writing on the wall in the bitter winter months of 1917-18 and sought sanctuary elsewhere in a fractured Europe, riven by war. Later events, such as the so-called Terror Famine (and associated famines in Soviet lands) of 1933-34 and the Great Purge (or Great Terror) of 1936-38, turned many Old Bolsheviks away from the Party. I’m also interested in this era of writing because of its historical context. To write critically, to write truthfully, took some strength to do when the repercussions could be so severe. Fictional works too were often suppressed or destroyed. In recent days I have read a number of news articles focused on the killing or physically harming of journalists and educators worldwide, from Turkey (political oppression and murder) to Brazil (harassment), America (political pressure and threats) to Bulgaria (murder) and Malta (murder). In many countries facts, the search for justice and the will to present the truth to the public (and the public’s willingness to digest this) are under open attack, even in so-called democratic states where media, particularly investigative journalism, is demonised openly and widely. It would be crass to directly contrast the two wildly different contexts, but we must be aware that it is a continuing balancing act – to report and to be critical, either through fiction or non-fiction, is always an act on a knife-edge. To tell the truth you sometimes have to give up your freedom; you may even have to give up your life and those of who you love to inform the world. Please be aware that this post will be regularly updated to include annotations on the volumes listed below. It will also be added to as and when I read new volumes. Alexievich, S. 2016. Chernobyl Prayer. Translated from the Russian by Anna Gunin and Arch Tait. London: Penguin Classics. Alexievich, S. 2016. Second-Hand Time: The Last of the Soviets. Translated from the Russian by Bela Shayevich. London: Fitzcarraldo Editions. Alexievich, S. 2017. The Unwomanly Face of War. Translated from the Russian by Richard Pevear & Larissa Volokhonsky. London: Penguin Classics. Svetlana Alexievich (1948-), a recent Nobel Prize Winner for Literature from Belarus, is justly famous for ‘her polyphonic writings, a monument to suffering and courage in our time’ as cited in her award. A recent trio of English-language translations have brought her to greater attention within the Anglo-sphere and introduced many to her unique style of letting her interviewees talk uninterrupted. For some this may blur the line between fiction and non-fiction, but the results are an intimate look into the lives of those that have been hidden for so long. The above trio of volumes deal, respectively, with the Chernobyl nuclear accident, the fall of the Soviet Union throughout the late 80s and 90s and its impact, and the role of females in the Second World War and the aftermath in the USSR. Applebaum, A. 2004. Gulag: A History of the Soviet Camps. London: Penguin Books. Applebaum, A. 2013. Iron Curtain: The Crushing of Eastern Europe. London: Penguin Books. Applebaum, A. 2017. Red Famine: Stalin’s War on Ukraine. London: Allen Lane. Beevor, A. 2007. Stalingrad. London: Penguin. This is the book that started my initial interest in understanding the Russian position in the Second World War, particularly in understanding the impact that the pivotal battle of Stalingrad (now Volgograd) had in breaking Hitler’s Wehrmacht. Beevor (1946-) writes a cogent, richly sourced analysis of the battle and its historical importance as it raged in the cold winter of 1942-43. Conquest, R. 2007. The Great Terror: A Reassessment. Oxford: Oxford University Press. Kotkin, S. 2015. Stalin: Paradoxes of Power 1878-1928. London: Penguin. Kotkin, S. 2017. Stalin: Waiting for Hitler 1928-1941. London: Allen Lane. Together, with the volume ‘Paradoxes of Power’, ‘Waiting for Hitler’ is the second in a trio of volumes that paint a deeply researched biography of Joseph Stalin (1878-1953), a Soviet revolutionary and General Secretary and Premier of the USSR. I’m currently half-way through the second volume and it is an eye-opening body of work, one that I highly recommend to anybody with an interest in history or modern history. Understanding the USSR (and the transformations after its fall) is fundamental to today’s world state and to the underpinning of politics on the international stage. By focusing on the figure who helped take over after the death of Vladimir Lenin in 1924, Kotkin (1959-)provides a richly researched narrative of the day-to-day running of the Russian Soviet Republic and eventual USSR as viewed through Stalin’s immense capability for work, political understanding, and brutality. Merridale, C. 2013. Red Fortress: The Secret Heart of Russia’s History. London: Allen Lane. Plokhy, S. 2017. Lost Kingdom: A History of Russian Nationalism from Ivan the Great to Vladimir Putin. London: Allen Lane. Sakwa, R. 2016. Frontline Ukraine: Crisis in the Borderlands. London: I. B. Taurus & Co. Ltd.
Solzhenitsyn, A. 2003. The Gulag Archipelago 1918-56: A Experiment in Literary Investigation. Translated from the Russian by Thomas Whitney and Harry Willets, abridged by Edward Ericson Jr. London: The Harvill Press. Steinbeck, J. & Capa, R. 2000. A Russian Journal with Photographs by Robert Capa. London: Penguin Classics. It is always a pleasure to read Steinbeck’s non-fiction work and this journal, wrote in the late 1940’s after a visit throughout the USSR with the celebrated war photographer Robert Capa, bears all the hallmarks of his wit and comedic flair. Still this is a sombre read of the after effects of the Second World War, a war which devastated the population and infrastructure of the Soviet Union. The chapter regarding the visit to Stalingrad (today called Volgograd) is particularly harrowing. Criticism of the USSR is lacking however and this was noted in the reviews and discussions following the book’s publication. Teffi. 2016. Memories – From Moscow to the Black Sea. Translated from the Russian by R. Chandler, E. Chandler, A. M. Jackson & I. Steinberg. London: Pushkin Press. Teffi (1872-1952, pen name of Nadezhda Alexandrovna Lokhvitskaya) was a famous humourist writer in the early 20th century best known for her contributions to the magazine Satyricon. ‘Memories’ documents her overland flight from St. Petersburg to the Black Sea where she caught a ferry to Turkey in 1919, following the twin revolutions of 1917 (the February overthrow of the Tsar and the Bolshevik revolution in October) and the subsequent political crack downs that followed. Although the volume deals with a particularly dark affair of fleeing one’s home country, this memoir is particularly funny as Teffi makes her observations and relies on her hilarious and indefatigable guide, Gooskin. She spent the remainder of her life in Paris, France, never to return to Russia. Wells, H. G. 2012. Russia in the Shadows (Classic Reprint). London: Forgotten Books. A gem of a republished book by Forgotten Books. This volume recounts H. G. Wells’ (1866-1946) second visit to Russia in 1920, at a time of profound change following the February and October revolutions in 1917 and the subsequent brutal Civil War. H. G Wells was known as a fiction writer of some renown, for both The Time Machine (1895) and War of the Worlds (1898), however he was also prolific in a wide range of genres, particularly on social commentary and had an abiding interest in the Soviet experiment. This volume covers his experiences with his son in both St Petersburg and a brief trip to Moscow, covering a range of viewpoints on the Soviet social enterprise and its effect on the Russian country at large. This volume is a great read and the author has a very interesting interview with one Lenin, and H. G. Wells isn’t one for holding back on his own viewpoints. Chandler, R. (ed.). 2012. Russian Magic Tales from Pushkin to Platonov. London: Penguin Classics. A fundamentally important introduction to the cultural and traditional importance of magic tales within the Russian and Slavic imagination. Chandler introduces a range of authors, including Platonov and Teffi, who tackle long-standing magic tales where transformation of both lives and forms becomes a bubbling, and often humorous, vehicle to comment on their own historical context. This is a great book to become familiar with figures mentioned throughout Russian traditional culture, such as Baba Yaga, which still appear in modern media (think of Zvyagintsev’s 2017 film Loveless and the grandmother figure living in the woods. Babel, I. 2016. Odessa Stories. Translated from the Russian by Boris Drayluk. London: Pushkin Press. Isaac Babel (1894-1940) was one of the highest writers authors to die during Stalin’s Great Purge (otherwise known as the Great Terror). The Great Purge dated from roughly 1936-38 and spread across the Soviet Union and ultimately saw many hundreds of thousands (possibly millions) put to death or sent to prisons during purges of the military, political, cultural, and professional classes, and the so-called ‘Kulak’ class. ‘Odessa Stories’ is a collection of Babel’s thrilling tales set in the primarily Jewish coastal city by the Black Sea. Famously introducing the character of Benya Krik, the gangster, the tales uncover the seedy underbelly of the Ukrainian city. Among the stories is a moving account of the effect of a program against the Jewish residents. Berberova, N., Felsen, Y., Gazdanov, G. & Kuznetsova, G. 2018. Four Russian Short Stories. London: Penguin Classics. Not strictly historical, but an insight into four disparate writers who fled Russia following the Bolshevik takeover in 1917 and spread themselves across Europe in an émigré cultural diaspora. Each story in this short paperback deals with the outcome of a death and its impact, eith the feeling of loss rippling through the pages. Bulgakov, M. 2007. The Master and Margarita. Translated from the Russian by Larissa Volokhonsky and Richard Pevear. London: Penguin Classics. Gessen, K. 2018. A Terrible Country. London: Fitzcarraldo Editions. Whilst not dealing directly with the Soviet Union (as Keith Gessen’s highly personal novel is set in 2008), the turbulent 20th century does cast a long shadow in this entertaining and often hilarious novel of one man rediscovering his birth country whilst having to look after an aging relative. The historical and modern social impacts of violently shifting cultural and political landscapes are well observed and captured in this novel. They are gently, and believably, entwined with both family members and the friends that the main Soviet-born character, Andrei Kaplan, make in modern-day Moscow after leaving behind his life in America. Grossman, V. 2006. Life and Fate. Translated from Russian by Robert Chandler. London: Vintage. Often described as the 20th century’s War & Peace, Life & Fate is a monumental novel of insight into the USSR during the raging battle of Stalingrad in 1942-43. Centered upon the family of Vicktor Shtrum and the Shaposhniokova sisters, Grossman introduces a panoply of figures across the length and breadth of the USSR and develops their role within the Great Patriotic War (as the Second World War is known in Russia). This multifaceted novel dissects Stalinism and Nazism, the nature of the State itself, and the vying reality of Jewish identity caught between the Soviet sphere and the impact of invading German forces. Grossman, V. 2011. Everything Flows. Translated from the Russian by Robert and Elizabeth Chandler, and Anna Aslanyan. London: Vintage. Platonov, A. 2010. The Foundation Pit. Translated from the Russian by Robert and Elizabeth Chandler, and Olga Meerson. London: Vintage. Shalamov, V. 2018. Kolyma Stories: Volume One. Translated from the Russian by Donald Rayfield. New York: New York Review of Books. Sholokhov, M. 2017. And Quiet Flows the Don. Translated from the Russian by Stephen Garry. London: Penguin Classics. Sholokhov, M. 1984. The Don Flows Home to the Sea. Translated from the Russian by Stephen Garry. London: Penguin Classics. Solzhenitsyn, A.. 2000. One Day in the Life of Ivan Denisovich. London: Penguin Classics. Solzhenitsyn, A. 2003. Cancer Ward. Translated from the Russian by Alexander Dolberg. London: Vintage Classics. Zamyatin, Y. 1993. We. Translated from the Russian by Clarence Brown. London: Penguin Classics. Nury, F. & Robin, T. 2017. The Death of Stalin. London: Titan Comics. Koschorrek, G. K. 2002. Blood Red Snow: The Memoirs of a German Solider on the Eastern Front. London: Greenhill Books. Sajer, G. 1999. The Forgotten Soldier: War on the Russian Front – A True Story. London: Cassel Military Paperbacks. The above two volumes, and their veracity of truthful experience, have both been discussed time and time again by critics and reviewers in their description of life on the Eastern Front as German soldiers. Regardless of the truth both volumes present hideous experiences on facing the Red Army during WWII, first claiming new territories and then slowly losing them, mile after bloody mile. Lately I have been reading Catherine Merridale’s Red Fortress (2013), an excellent and well researched book on the history of the Kremlin and of Russia at large. So far I am only half way through the book but I am thoroughly enjoying it. I’ve written briefly before about reading Russian literature (specifically Gogol, Platonov, Sholokhov, Solzhenitsyn and Tolstoy), but I realised recently my small bedside pile of books has become a small mountain, swelling as it has with a glorious mixture of archaeology, osteology and fictional offerings. Never being able to resist a bookshop I also added Applebaum’s Iron Curtain (2013) to it, thinking that it would make a particularly good companion piece to Merridale. On a separate trip to the library I happened to come across Chandler’s 2012 collection of Russian magic tales (which are often termed as Skazka in Russian). Taken from a variety of Russian authors who span across three centuries, the book represents the authors who had collated and collected the tales and then wrote them down in their own hand. I have never particularly been into magic tales or folk stories, but upon delving into this collection I found I couldn’t really resist not borrowing the volume. It also makes a beautiful companion piece to the above two history books, grounding me as it does in the oral cultural tradition of folk tales that have been told for centuries, and in some cases for millennia, in Slavic populations. The tales are also the perfect length to digest and read through on train journeys, and provided a welcome relief from my somewhat heavier archaeological readings. 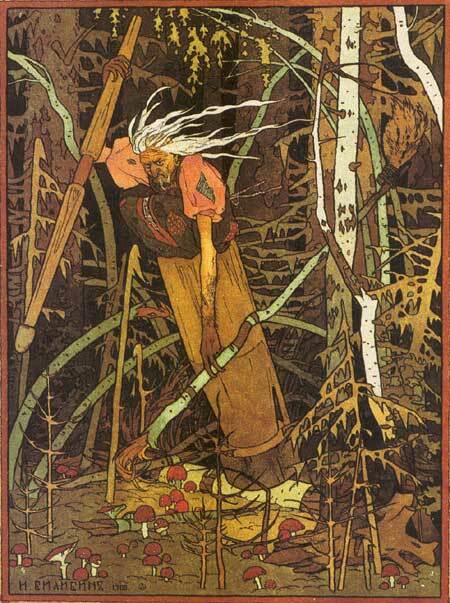 A representation of Baba Yaga by the artist Ivan Bilibin. In Russian and Slavic folklore Baba Yaga is an ambiguous and often ferocious older women who lives deep in the forest, either helping or hindering those who seek her out. Along with Koschey the Deathless, Vasilisa the Beautiful and other colourful characters, Baba Yaga often pops up in the folk tales of Eastern Europe/Russia. (Image credit: Ivan Bilibin). I have really come to enjoy reading Chandler’s collection of skazka, particularly in the arrangement of the book itself which forms a readable narrative of the historical documenting of the skazka and of the re-working of some of the skazka by selected Russian authors themselves. This approach not only highlights the interesting form and content of the tale itself but also briefly documents the historical and cultural context that the author worked in to produce or collate the tale. Generally the skazka can be viewed as one of three general presentations: scenes from real life, magically tales or tales involving talking animals. Often they can be mixed but they often include characters (such as Baba Yaga and her three knights) that are used repeatedly in a wide variety of circumstances. In general folk tales are a valuable cultural resource in a few senses of the term. Firstly, they are essential in helping to understand cultural modes of oral transmission. This can be identified in two ways, by either understanding differences at regional or national levels between tales and in parsing, or understanding, the developing identities by solidifying through oral repetition a unifying myth or theme (Chandler 2013: x). Secondly, they can of course also imbue moral and ethical lessons to the listeners or participants, particularly in the role of individuals in societies (Forrester 2012: 427). Thirdly, it must be noted that some of the tales are pretty vivid in their detail of the character traits and actions, but this is the fun of reading and hearing the tales. (I recommend reading them out to get a sense of what the oral tradition was like). These are real and deeply developed characters that although may change their actions in some aspects from tale to tale, they still largely retain their purpose and description or function. All in all I am glad I stopped to read through a few of the tales in Chandler’s book at the library, as I feel it has made me appreciate the work of some of my favourite authors a whole deal more. By making me familiar with several important folk characters in the Slavic folk world, the deeper meaning of some of the recurring characters and folk myths that pervade through Russia’s literature becomes evidently clear. This is especially the case when I originally read Platonov’s The Foundation Pit (2010), a novel that he wrote during the early Soviet period which includes many allegorical and frank representations of the oral folk body of work. To my mind folk tales in general are a pivotal part of the rubric of culture, a one that sadly is often missing in the archaeological record. So if you find yourself on an excavation this summer in the middle of nowhere, why not make a fire, grab a few drinks and tell tales to keep an oral tradition alive? Chandler, R. (ed.). 2012. Russian Magic Tales from Puskin to Platonov. London: Penguin Classics. Forrester, S. 2012. ‘Baba Yaga: The Wild Witch of the East’. In Chandler, R. (ed.) Russian Magic Tales from Puskin to Platonov. London: Penguin Classics. Platonov, A. 2010. The Foundation Pit. London: Vintage.